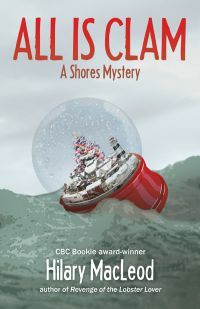 Family stories and secrets unfold in All Is Clam, a Shores Christmas mystery. A man, woman and child move into the village and pitch a tent in an old abandoned house. An antiquarian book dealer and Tarot reader follows them. The Hanged Man keeps turning up in his card readings while he searches for an old diary, the key to the family legacy, a legacy which he now believes may be murder. Another murder for Mountie Jane Jamieson to solve. She has been assigned permanently to The Shores because of the number of deaths in the past, but it seems that where Jamieson goes, murder follows, as it does now. Murder…or an accident? Jamieson can’t decide – and she can’t blame the killer, partly because of her own past. Her secret and the family secrets of Annabelle, Gus and Ian come to light in the glare of a village that is so lit up it can be seen from space. Fully in the holiday spirit is a gut-wrenching Christmas meal at the Hall and a Christmas concert that gives the book its name.